"This is a mac and cheese - bologna mixture that my kids love!" Prepare macaroni and cheese mix according to package directions. In a separate pan, prepare brown gravy mix according to package directions. Place bologna slices in a skillet over medium-high heat, and fry until the edges are crispy. Cut bologna into small pieces. Mix brown gravy and bologna into macaroni and cheese, and serve immediately. See how to make this quick and easy dinner. As a college student, this is the perfect meal. I had all the ingredients in my pantry. 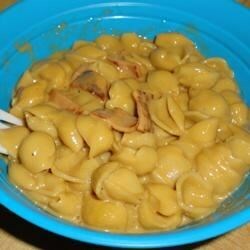 I used Velveeta Shells & Cheese and it was delicious! I highly recommend this dish!